Predicting the sales of products from their properties (qualities, appearances, price, and so on). Grouping people according to their personality traits. 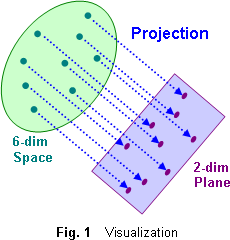 Visualizing the distribution of data in a multidimensional space (which cannot be seen by us living 3-dimensioanl world) (Fig. 1). 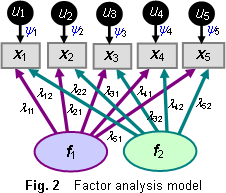 Finding the latent psychological factors underlying manifest behavioral patterns (Fig. 2). Exploring the three mode structure of pictures by impressions by persons from the impressions that pictures give persons (Fig. 3). Modeling the causal relationships among the phenomena in the world.